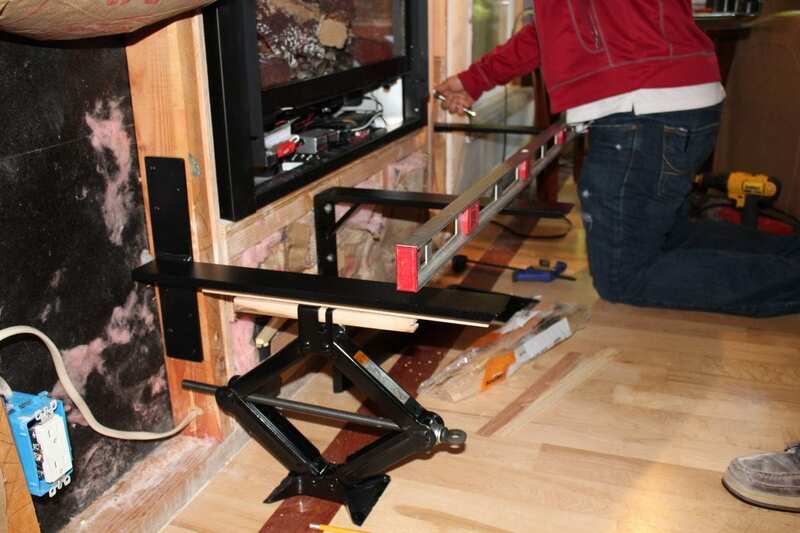 Recently the Right On Bracket team helped a local customer install a a series of brackets for a fireplace hearth. 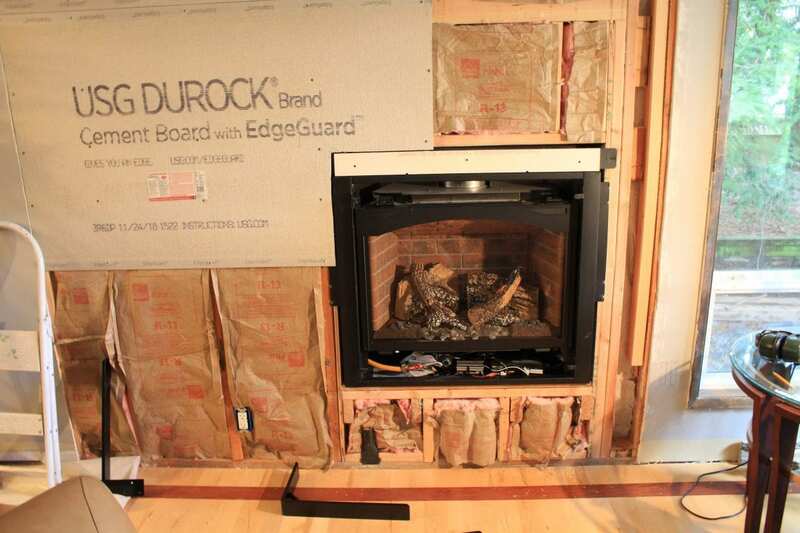 The plan was to install an 8 foot long granite hearth in front of a fireplace. The hearth would be suspended a foot off the ground with a “floating” look. The key was to have the hearth be strong enough to support the weight of people sitting on top of it. For this installation, we used a series of hidden shelf brackets and right angle brackets. You’ll notice the right angle brackets are reinforced in the photos below. We did a custom order to reinforced because the client wanted an extra high weight capacity and solid hold. We probably didn’t “need” to do this, but he wanted the extra security. We also used our popular heavy duty hidden shelf brackets. We didn’t reinforce these brackets, as we were confident they were already plenty strong enough. 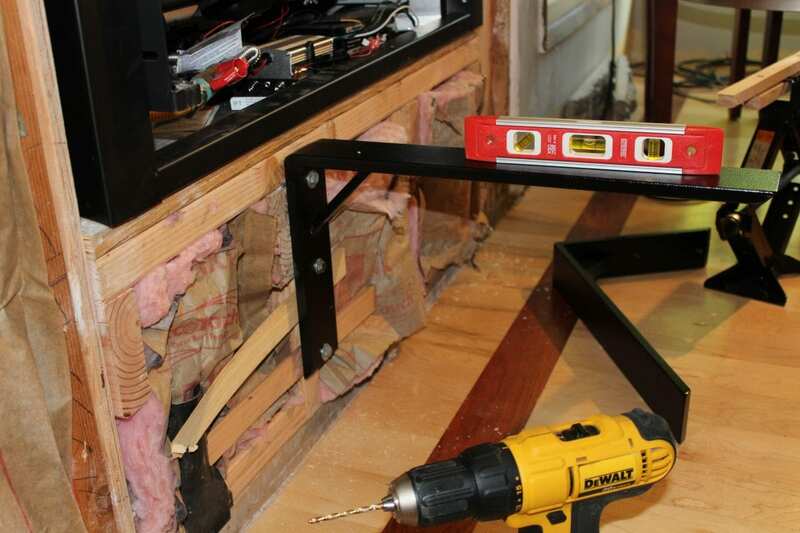 During the installation, we found that using a car jack made it easy to install these brackets! 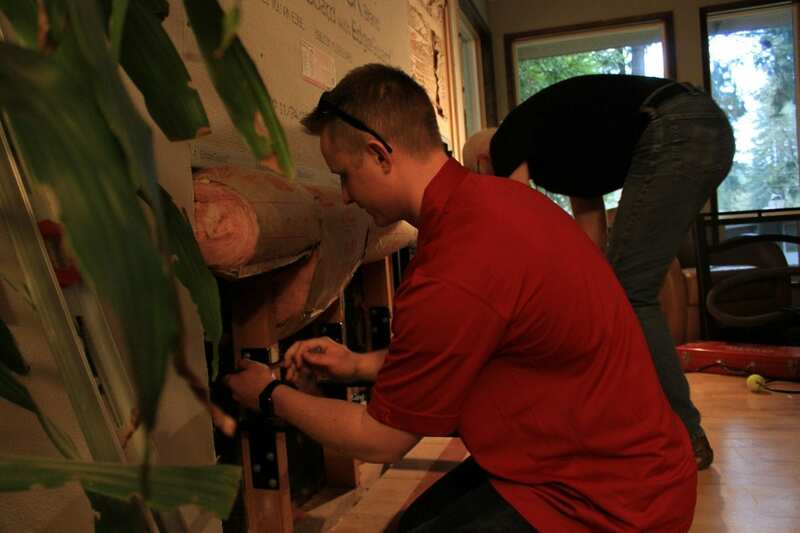 It allowed us to hold the bracket steady and make sure it was perfectly level for installation. 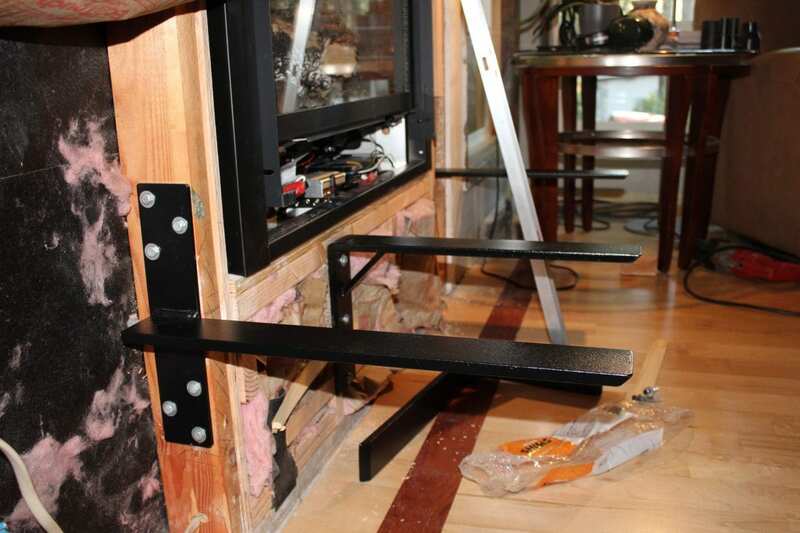 For all these brackets, we used stainless steel lag bolts to mount them to the studs. They don’t look as great as wood screws, but because these brackets would be hidden behind drywall it didn’t matter. 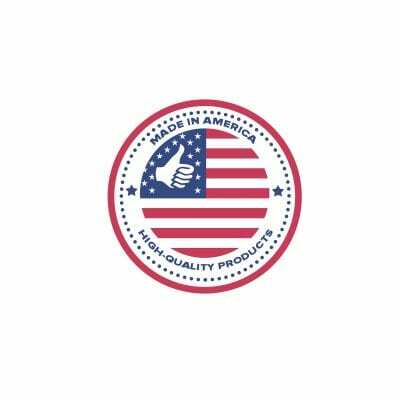 We did this because lag bolts are extremely strong and would guarantee a lifelong and reliable hold. When we were finished, we had a combination of hidden shelf and right angle brackets extending a support to hold a granite slab. The granite weighed about 300 pounds and all these brackets together will easily hold this weight. Once the drywall is installed, the granite slab will simply rest of the supports. Notice a bracket wasn’t installed. The stud was had pre-drilled holes in the spots we needed to mount the bracket. Since this wouldn’t support a reliable hold, we recommending filling the holes and re-drilling to ensure a reliable bracket mount. 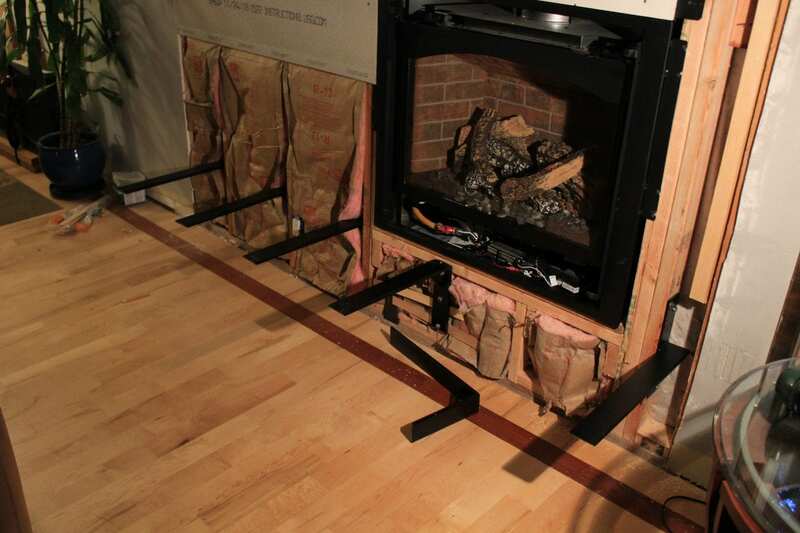 This entry was posted in Right On Bracket Recommends and tagged fireplace hearth, fireplace hearth installation, heavy duty hidden shelf brackets, hidden shelf brackets, reinforced right angle brackets, Right Angle Brackets.